My article What ails US intelligence? is posted on Sify.com website. Click here to read. This Book Review published by The South China Morning Post is fascinating. Koon-chung Chan's story is in itself fascinating. Has China been on the wrong track? Was Deng Xiaoping's slogan: "To become rich is glorious' only maya (illusion)? (1) The Party-state’s dictatorship. In the novel, the Party-state’s manipulation and control of the nation’s mentality are symbolically represented by the government treating China’s drinking water with a chemical which can change people’s moods. This is the secret behind the entire nation’s intoxication with the feeling of happiness. (2) Chinese intellectuals’ abandonment of their role as “social conscience” and their complicity with the Party-state. In response to Old Chen’s question of “whether Chinese intellectuals are really willing to reconcile with the Party,” Zhuang Zizhong repudiates this as a pseudo-question. As he argues, “the real question is not whether the intellectuals are willing to reconcile with the Party but whether the Party is willing to forgive the intellectuals [for their trouble-making and disloyalty]” He asserts that 'recognition by the Party' is the greatest success and honor possible for Dushu and for himself. It turns out that Chinese intellectuals are bought into the system through the material gains and social status granted to them by the Party. About amnesia, it is unfortunately also rife in India. Just look at Senior Gen. Than Shwe, Myanmar's junta boss who came on a 5-day "religious" visit to India. 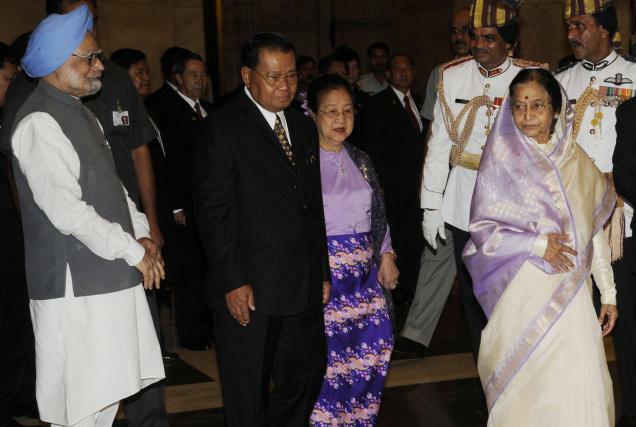 Though Shwe is one of the worse dictator of the planet, he is a guest of President Pratibha Patil. 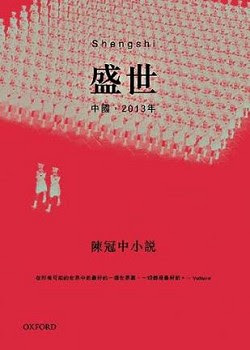 Book Review of Koon-chung Chan's "Shengshi"
It's the year 2013 and China is stronger and richer than ever before, while the rest of the world is still reeling from a huge economic tsunami that struck a year earlier. Starbucks is now owned by the Wang Wang Group, and the hottest new drink around the world is longane dragon well tea latte. 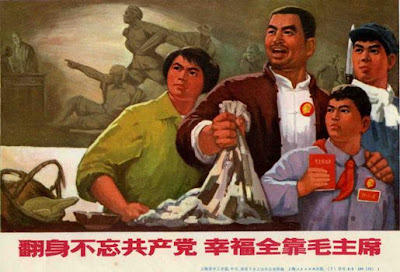 The authoritarian, and often ruthless, Communist Party faces no serious opposition and is patting itself on the back for not following the path of the West. Capitalism with Chinese characteristics is thriving and foreigners who once lambasted China over human rights are now afraid to offend China. Most interesting, the majority of the Chinese people, at least the residents of major cities, are enjoying unprecedented fat times, and couldn't be happier. This is China's future as described in The Golden Age, a new novel by Hong Kong writer Chan Koon-chung, who has lived on the mainland since 2000, spending the last nine years gathering string for this book. The Chinese title, Shengshi Zhongguo 2013, which can be translated as a prosperous and grand period, has been used to describe the two apogees of imperial history, the Han and Tang dynasties. It's also a term that is appearing more and more frequently in the Chinese media today and which is becoming a daily part of conversations - as a giddy description of present-day China. While the book was released in recent months in Hong Kong and Taiwan (it's too sensitive to be released on the mainland), it's creating an increasingly loud buzz among mainland intellectuals in China for it's realistic description of contemporary China and its veiled criticism of the growing number of Chinese who have either bought into the system or have been bought by it. The story is told through the eyes of Lao Chen, a Taiwanese writer who has lived in Beijing for many years, and who shares the strange mass happiness that has smitten the majority of China's population. Or at least he seems quite complacent until he accidentally runs into two long-lost friends, Xiao Xi and Fang Caodi - the only discontented people he's encountered in a long while. Xiao is a 1980s activist who is frustrated because her former intellectual friends have abandoned the fight against repression in exchange for more comfortable living. "They've changed ..." she tells Lao when they meet. "They've all become so satisfied." Fang, the son of an early Communist defector, and a drifter, is on a quiet mission to prove that an entire month has been erased from the collective memory of China's 1.3 billion people, with the exception of a small number who seem to have retained their memories -including both Fang and Xiao. Lao, a successful writer, is a bit disconcerted by the strange claims of his former friends, and he has little sympathy for their cause, until they involve him in the kidnapping of a senior official who spits out the truth about what the government has been doing. As He Dongsheng comes out of his drugged state, Lao, Fang and Xiao begin to interrogate the official, who is tied to a chair. He willingly describes how trouble broke out in a few places around China following the economic crisis of 2012, and how, according to a secret party plan, the People's Liberation Army, People's Armed Police and police purposely hold back, except in Tibet and Xinjiang , waiting for the chaos to reach a point where the frightened population becomes afraid of anarchy and begs for the government to step in. When the PLA eventually marches into one city to restore order, the people line the streets to welcome it. In an ensuing "strike hard" campaign, the party takes advantage of its popular mandate to wipe out all its foes. The campaign is so vicious that the government decides to place a new drug into the water system and all beverages, which has the effect of putting the country on a collective high. An unintended plus is that the vast majority of the population has had its memory of the three weeks of chaos completely erased. To be safe, the government has taken advantage of its good fortune - no one honestly knows how this happened - to destroy books and newspapers and to rewrite what's available on the internet. When Lao visits a book store and asks for books by several famous authors, a search of the store computer indicates the books don't exist. When he confronts the manager and asks about books by Yang Jiang, a famous writer, the manager stares at him, confused, and says, "Which Yang Jiang?" The Golden Age represents the frustrations of many intellectuals, who previously had high hopes for reform. Chan says that while the party launched huge economic reforms over the past three decades, politically not much has changed. "In the 1980s there were hopes for constitutional democracy but it's now very obvious that's not the way to go for China," he says, recognising the reality. "A new Chinese-style governance has been established and is accepted." WikiLeaks has done it again! The online organization has now posted more than 90,000 classified military field reports originating from the Afghan front. According to Julian Assange, WikiLeaks’ founder, the documents “reveal broader and more pervasive levels of violence in Afghanistan than the military or the news media had previously reported.” According to him, the objective of his organization is to document ‘unethical behavior’ by governments and corporations. Since 2006, WikiLeaks has exposed the dumping of toxic material off the African coast, the membership lists of a racist British party, the operating manual of the US prison in Guantánamo, a helicopter attack in Bagdad called ‘Collateral Murder’ and a cable entitled ‘Reykjavik13’ about the banking crisis in Iceland. While the revelations got a lot of ink in the world media, a series of articles by The Washington Post has remained out of the sight of commentators, though the consequences of the reporters’ findings could have tremendous consequences on the war in Afghanistan and elsewhere. The Post reporters wanted to understand more about the “top-secret world the government created in response to the terrorist attacks of Sept. 11, 2001.” Dana Priest and William Arkin, who worked for two years on the subject, soon discovered that it has “become so large, so unwieldy and so secretive that no one knows how much money it costs, how many people it employs, how many programs exist within it or exactly how many agencies do the same work”. The US intelligence budget was for the first time announced last year: 75 billion dollars, 2 ½ times the size it was before 9/11 (and it does not include military activities or domestic counter-terrorism programs). • Some 1,271 government organizations and 1,931 private companies work on programs related to counterterrorism, homeland security and intelligence in about 10,000 locations across the United States. • An estimated 854,000 people, nearly 1.5 times the population of Washington, D.C., hold top-secret security clearances. 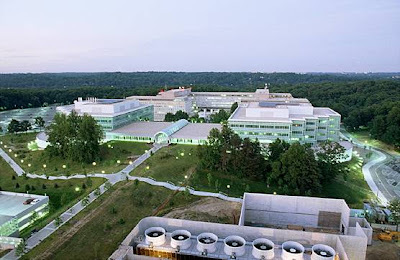 • In Washington and the surrounding area, 33 building complexes for top-secret intelligence work are under construction or have been built since September 2001. Together they occupy the equivalent space of almost three Pentagons or 22 U.S. Capitol buildings — about 17 million square feet. • Many security and intelligence agencies do the same work, creating redundancy and waste. For example, 51 federal organizations and military commands, operating in 15 U.S. cities, track the flow of money to and from terrorist networks. • Analysts who make sense of documents and conversations obtained by foreign and domestic spying share their judgment by publishing 50,000 intelligence reports each year - a volume so large that many are routinely ignored. Even Defense Secretary Robert M. Gates and Central Intelligence Agency Director Leon Panetta admitted in interviews to The Post that there was a problem. Though Defense Secretary Gates said that he does not believe the system has become too big to manage, he acknowledged that getting precise data is sometimes difficult: “Nine years after 9/11, it makes a lot of sense to sort of take a look at this and say, ‘Okay, we’ve built tremendous capability, but do we have more than we need?’,” he told The Post. CIA Director Leon Panetta announced that he had “begun mapping out a five-year plan for his agency because the levels of spending since 9/11 are not sustainable”. In other words, the different agencies are over-doing their job, but without the corresponding results. This is the story of the US Intelligence system. One understands better why they never found out about Pokhran II (though it was 3 years before the 9/11 tragedy) and that today there are unable to find Osama bin Laden in Pakistan, although they seem to have information that he is moving around with his associate Mullah Omar (it was confirmed by Secretary of State, Hilary Clinton). One sometimes thinks that the good old spies à la James Bond or Mata Hari were more efficient than the top analysts seating in their bunkers (known as SCIF or ‘sensitive compartmented information facility’) in Washington DC who have hardly any idea where Kandahar or Ghazi are located. In other words, the US intelligence is being slowly privatized. Can you believe it? This does not sound good for Obama’s Administration (and the US citizens) because it means that these super-analysts, these super-spies are not working for their country (or in Afghanistan for the NATO Alliance), but only for money. In fact the so-called contractors are multinationals like any multinational in the world (except for the strict security clearance needed for their employees, but even here the clearance is sub-contracted to ‘specialized private’ companies). When money is the motivation, the results are bound to be tainted. This ‘privatization’ of the intelligence business is indeed a very dangerous game and it partially explains some of the finding of WikiLeaks: one hand of the Obama (and before Bush) Administration does not know what the other is doing. It has become apparent in Washington’s Af-Pak policy. Why could not the 854,000 people, 1,271 government organizations and 1,931 private companies working on ‘terrorism’ (or ‘counterterrorism’) have realized this? Everyone knew it in India, but it seems to be a discovery in the SCIFs of Washington. Let us hope that it will now percolate further to the White House: the hub of international terrorism is Pakistan and its boss has just been given a 3-year extension. One can only hope that in the future more leaks will reveal further the role of the Pakistan Army and the ISI not only in the Afghan mess, but also in Kashmir (I would include the role of Chinese in the region). 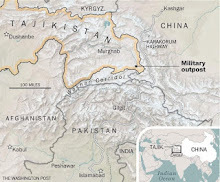 An excellent paper (China’s Caution on Afghanistan—Pakistan) by Andrew Small for the Center for Strategic and International Studies of the Washington Quarterly speaks of “this entire strand of China’s thinking, which requires a state of managed tension in the region, cuts directly against the US efforts to dissuade Pakistan from its India-centric military strategy”. It would great to have leaks on this. From match-making for young Indians to choosing the Indian cricket team to rescuing nations from economic ruin, many commentators feel Paul could be very useful. Will the octopus please help? Claude Arpi looks at ten things where Paul The Octopus can make a difference. 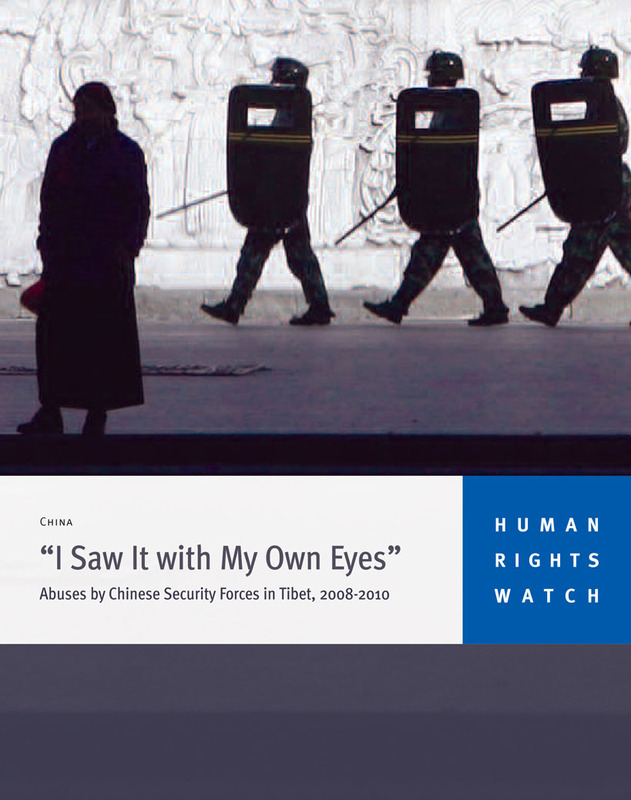 A new Report of Human Rights Watch (HRW) entitled “I Saw It with My Own Eyes — Abuses by Chinese Security Forces in Tibet, 2008-2010” has recently made the headlines. It deals with the unrest on the Tibetan plateau in March/April 2008. As a lot of ink has already gone into the subject, one could ask why publish a new report, two years after the happenings? It is not really the sequence of events which preceeded those tumultuous days, but rather the way the Chinese authorities handled the riots which are unveiled in the HRW report. For the human rights organization: “the Chinese government has yet to explain the circumstances that led to dozens of clashes between protesters and police. It has not addressed how its security forces responded to the unrest …Nor has it revealed the fate of hundreds of Tibetans arrested during the protests, or disclosed how many it has detained, sentenced, still holds pending trial, or has sentenced to extrajudicial forms of detention”. In other words, Beijing has something to hide. 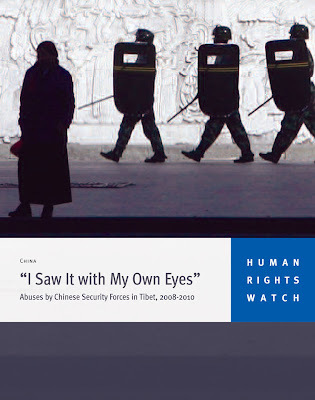 Bequelin considers that it is now difficult for Beijing to refute the HRW Report based on official Chinese sources and eyewitness accounts (200 interviews conducted by HRW between March 2008 and April 2010). One of the conclusions is that the scale of human rights violations was far greater than previously believed: Chinese forces broke international laws such as disproportionate use of force, torture and arbitrary detention. Further, it reveals that violations continue, including disappearances, wrongful convictions or persecution of families. Let us remember the facts. 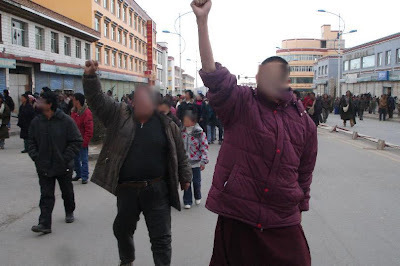 Troubles started on 10 March 2008 when 300 monks from Drepung Monastery, near Lhasa started a peaceful protest march towards Barkhor Street, in Central Lhasa. A few monks were immediately arrested by Public Security Bureau (PSB) officials. The next day, the Sera Monastery in turn got involved in peaceful demonstrations. Again some monks were arrested, severely beaten and manhandled by PSB officials. The following day, about 2,000 Chinese troops fired tear gas to disperse hundreds of Sera Monastery monks calling for the release of their fellow monks while shouting pro-Tibet slogans. March 14, 2008 will remain etched in the history of protests in Tibet. It was subsequently termed ‘the 3/14 incident’ by Beijing, probably to make it sound like a terrorist attack against the People’s Republic of China. In the morning, about one hundred monks from Ramoche monastery began to demonstrate about monks arrested on the previous days. Once again they were stopped and beaten by the police. This infuriated the Tibetan by-passers. From then on, the situation went out of control. Soon, a large scale demonstration involving tens of thousands of people lead to a confrontation between Tibetans and the People’s Armed Police. The unrest spread to all the Tibetan-inhabited areas of Qinghai, Gansu, Sichuan and Yunnan. All the events occurred when local Party cadres were attending the annual National People's Congress in Beijing. The Chinese government immediately put the blame on the ‘Dalai Lama and his clique’. An official in Lhasa told Xinhua that there had been enough evidence to prove that the sabotage in Lhasa was "organized, premeditated and masterminded" by the Dalai clique. Though the Chinese government always maintained that it applied ‘limited’ use of force (and spoke about the loss of 10 lives ‘mainly Chinese and Muslim business persons!’), the Dalai Lama’s Administration mentioned at least 100 dead. Interestingly, another report prepared by a Chinese think-tank, Beijing Gongmeng Consulting was published in 2009. It had also contradicted the Party’s official version. The authors, a group of Chinese lawyers spent one month in Tibet “interviewing Tibetan monks, nomads, farmers, scholars, migrants, artists, and business people”. The Lawyers’ Report found that in Tibet, the difficult terrain has created “locally fixed power networks, which inevitably lead to a high incidence of corruption and dereliction of duty.” For the Chinese lawyers, this new aristocracy, which is ‘legitimized by the Party’, is even more powerful than the old one. A similar conclusion was arrived at in the 70,000 character petition sent by the previous Panchen Lama to Premier Zhou Enlai way back in 1962, for which the Lama spent 17 years in jail. After his release, he worked closely with the Communist Government, but continued to be disturbed by the situation inside Tibet. In January 1989 while declaring open the tombs of his predecessors at the Tashilhunpo Monastery, he declared: “The Chinese rule in Tibet had brought more destruction than benefit to the Tibetan people”. Four days after delivering this historic speech (witnessed by the then Party Boss, today President Hu Jintao), he passed away. The mysterious nature of his death generated a lot of speculation. Six years later, soon after the Dalai Lama formally announced that Gedhun Choeki Nyima, a six-year old boy born in Tibet, was the genuine reincarnation of the Eleventh Panchen Lama, the boy was arrested. Since then, he is known as the Youngest Political Prisoner in the World. Beijing later ‘discovered’ its own incarnation of the Panchen Lama who has recently been 'promoted' as a delegate to the Chinese People's Political Consultative Conference. Incidents like these are the root cause of the resentment of the local Tibetan populations against the Chinese occupants, there is no need to go further to understand the events of March/April 2008. The HRW report is however a welcome addition. My article Awaken the warrior published in The Pioneer is available by clicking here. The Chinese authorities seem highly disturbed by the fact that the Dalai Lama calls himself a 'Son of India'. Articles after articles are published in the official Chinese Communist press denouncing what they perceive as an heresy. The Dalai Lama is a Tibetan, born in Tibet, an Amdowa, born near Kumbum in the Eastern Province of Amdo, but culturally his tradition is born and flourished in India. During a recent encounter with the Dalai Lama, he explained: "I always describe Tibetan Buddhism as pure Buddhism from the Nalanda tradition. In Mahayana Buddhism, whether it is from China, Japan, Korea, Vietnam or Tibetan, also Mongolia, we all recite the same Saddharma Pundarika Sutra or Lotus Sutra. We recite the same texts, all translated from Sanskrit. We all practice Mahayana.The Buddhist tradition of Nalanda uses Sanskrit language; Nalanda is the true promoter of the Mahayana tradition. 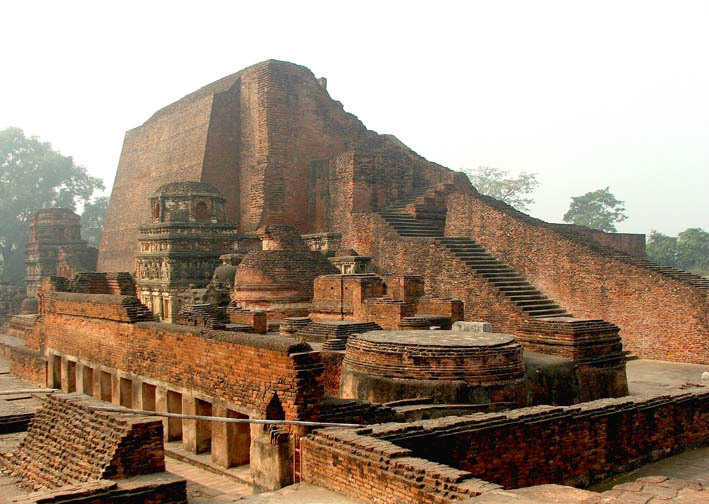 Nalanda had great masters like Nagarjuna and Arya Asanga. The important point is that during the 8th century, the Tibetan emperor invited a great master of Nalanda. His name was Shantarakshita. 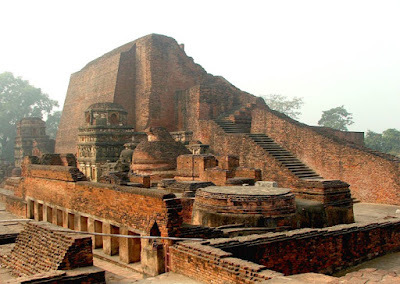 He was a famous, well-known scholar and master of Nalanda. He went to Tibet and spent the rest of his life there. He introduced Buddhism in Tibet. That is why I consider that Tibetan Buddhism is the authentic tradition of Nalanda. I myself studied the Nalanda tradition of Buddhism; first I learned by heart and memorised what we call the Root Texts. All these Root Texts have been written by Nalanda masters. Then, I continued the study and learned word by word with the help of commentaries, mainly written by Indian Masters from Nalanda. Of course, we have also some Tibetan commentaries. Therefore the Tibetan Buddhist tradition is the Nalanda tradition which combines the Sanskrit and the Pali traditions as well as Buddhist Tantrayana. Masters like Nagarjuna, Aryadeva and Chandrakirti wrote tantric treatises (in Sanskrit)." He can be therefore considered as a cultural ambassador of India, at least as far the Nalanda tradition is concerned. He never said that he represents the MEA, that is a Chinese invention. The fact is that there is today no better ambassador than the Dalai Lama to represent this tradition which has disappeared from the Land of the Buddha but belongs to the Indian cultural and religious heritage. The Tibetan leader said: "Sometimes, it irritates the Chinese officials. What to do?" 14th Dalai Lama lashed out for his self claim of "100% Indian"
Days ago, the Dalai Lama clique was quite engaged in celebrating the 75th birthday of the 14th Dalai Lama. The Dalai Lama's "merits and virtues" were unscrupulously honored through statements, congratulations and congregations bombarded by the bogus government, the bogus parliament, "Tibet independence" gangs as well as some western nosy parkers. In the meanwhile, the attack against the Chinese government was launched as usual. It seems that the Dalai Lama has lost his bearings by the lauds lashed by himself, he was especially impudent during an interview with India's New Delhi Television in Dharamsala on July 6. And only then, we could glimpse at some of his true thoughts. Now, I will make a brief introduction. A signed article released here Monday has criticized the Dalai Lama for his claim of "100% Indian", which has before bought him a bad name worldwide. At an Indian TV show "In conversation with the Dalai Lama" by the National Deli Television (NDTV) on July 6, 2010, the Dalai Lama went beyond his previous claim as “son of India” and made such remarks as above. Firstly, the Dalai Lama considers himself as a "100%" Indian. An ordinary person usually thinks of his hometown on his birthday. The Dalai Lama's own profile reveals that he was originally born in Qijiachuan, Huangzhong County of northwest China's Qinghai Province, with a folk name as Lhamo Thondup. His father Chocho Tsering and his mother Dekyi Tsering were both purely local peasants. 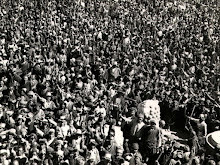 In 1939, Lhamo Thondup was escorted by a troop sent by the Chinese central government to Lhasa, as one of the candidates of the reincarnation boys of the 13th Dalai Lama. In 1940, the then National Government of China announced the approval of his succession to be the 14th Dalai Lama. From that time till his escape to India after he failed in his armed rebellion launched in 1959, the Dalai Lama was fed by the Tibetan people for at least 24 years. It is understandable that the Dalai Lama was reluctant or too ashamed to talk about his hometown in China, but facing the Indian reporters, he appeared extraordinarily enthusiastic and passionate when ignorantly claiming that "I refer to India as my country ... If you open my brain I am 100% Indian." What's more, the Dalai Lama shamelessly proclaims himself an "Indian envoy" for international affairs even without any of the approval by anyone from the Indian side. I always believe that it is the Dalai Lama's own business to choose his citizenship, for which in fact, nobody cares. However, now that the Dalai Lama decides to be an Indian, he then has no reason to make any indiscreet remarks towards issues related to China's Tibet about to give more concern over India's internal affairs. Obviously neither does the Dalai Lama seem to be interested in nor dare to do so. As "wise" as he is, the Dalai Lama clearly understands his position: Living in India and only by abusing China occasionally could he show his "courage and insight" and thus flatter a certain group of people in the world, but he is absolutely in no position to talk about India’s affairs in case his Indian daddy gets annoyed. A strange article was posted today on a Chinese official website on Tibet. It says that the Dalai Lama is reconsidering his position vis-a-vis independence. On June 18 1988, the Dalai Lama addressed the Members of the European Parliament in Strasbourg. Officially renouncing independence for his country, he explained: "I thought a long time on how to achieve a realistic solution to my nation's plight." He explained his new proposal (since then known as the Strasbourg Proposal): "The whole of Tibet should become a self-governing democratic political entity founded on law by agreement of the people for common good and the protection of themselves and their environment, in association with the People's Republic of China. The Government of People's Republic of China could remain responsible for Tibet's foreign policy. The Government of Tibet should however, develop and maintain relations, through its own Foreign Affairs Bureau, in the fields of commerce, education, culture, religion, tourism, science, sports and other non-political activities." Though many young Tibetans never accepted what they considered as a surrender to the Chinese invaders, the Dalai Lama has always stuck to his offer. The Chinese leadership has however never acknowledged the fact that the Tibetan leader was no more seeking independence from the 'Chinese motherland'. In June 1998 while on a visit to Washington DC. President Jiang Zemin offered to reopen the dialogue, but he put a condition, the Dalai Lama should renounce Independence (though he had already done so 10 years earlier). Clearly, Beijing had refused to acknowledge the message which was loud and clear. During the Joint Press Conference with President Clinton, the US President asked Jiang Zemin to discuss with the Dalai Lama: "I urge President Jiang [Zemin] to assume a dialogue with the Dalai Lama in return for the recognition that Tibet is a part of China and recognition of the unique cultural and religious heritage of that region." Then the US President added: "I have spent time with the Dalai Lama, I believe him to be an honest man, and I believe if he had a conversation with President Jiang, they would like each other very much." 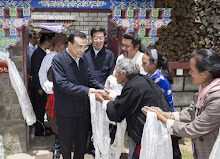 President Jiang answered: "As long as the Dalai Lama makes a public commitment that Tibet is an inalienable part of China and Taiwan a province of China, the door to dialogue and negotiation is open." Despite this declaration, and the reopening of the dialogue in 2002, the Chinese authorities have always said the Dalai Lama has never renounced 'independence', therefore the article reproduced below is rather strange. Or perhaps, the author has no knowledge of the background. Everything is possible. A signed article released here Monday has accused the Dalai Lama of reconsidering his approach of Tibet Independence and even violence in the future, which has before brought the Dalai Lama a bad name worldwide. At an Indian TV show "In conversation with the Dalai Lama" by the National Delhi Television (NDTV) on July 6, 2010, the Dalai Lama made such remarks which indicated that there may be sharp changes in his present stance. Reading this long article one understand better the blunders of the CIA and the wrong policies of the successive US Administrations. When you privatize your intelligence services, this is bound to happen. Agents are no more working for the highest values/interests of the State but for their own pocket. The latest wrong move is the foolish Af-Pak policy: the Obama's Administration pretends to fight terrorism in the West (Af) while defending terrorism in the East (Pak). This will lead nowhere. It is however in the 'contractors' interest' that the tamasha continues. They are getting richer by the day. In the meantime, Beijing is enjoying its 'all-weather' relation with Islamabad. And India will keep being squeezed. The problem is that New Delhi has also its own 'contractors', often based in Washington. It is what was called the Great Game during the 19th century. To read the entire article (5000 words) click here. The Thirteen Dalai Lama a Red hero? Is it a beginning of 'rehabilitation' of the Dalai Lama? 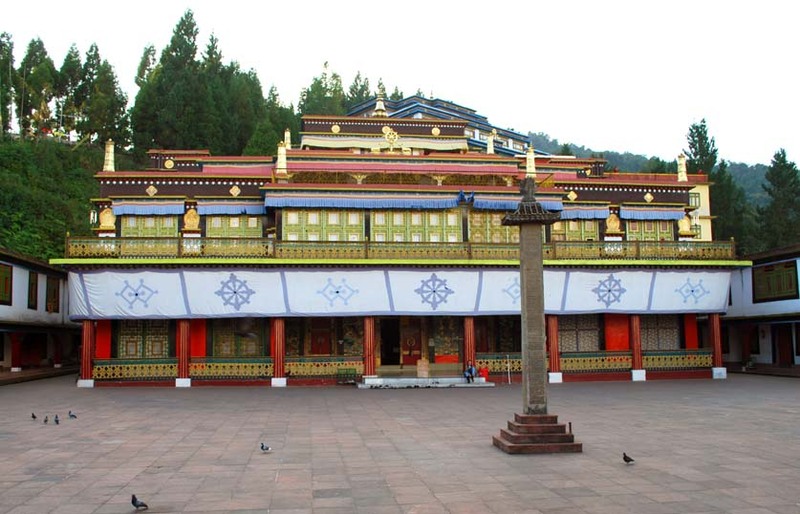 The house of the 13th Dalai Lama will be turned into a 'red relic'. It is what China Daily says today. Do the Chinese know the Thubten Gyatso, the Great Thirteenth proclaimed Tibet's Independence in 1912 when he returned to Tibet after two years of exile in India? In any case, it is good. Tibetans will now be allowed to visit his 'memorial'. Tibet to invest over 23m yuan in "red relics"
Tibet will apply to the central government for more than 23 million yuan ($3.39 million) to protect the "red relics" (revolutionary sites) this year, with the first batch of construction for protection projects already started, Xinhuanet.com reported on Wednesday. The protection projects comprise the hall of the Preparatory Committee for the Founding of the Tibet Autonomous Region, the Langzi Ha Museum and the old meeting room of the Party committee of Gyangze County. Tibet also plans to apply for more funds during the central government's 12th Five-Year Plan (2011-15) to completely repair the representative office of the People's Central Government in Tibet built in 1965, the gates of the former Tibet Military Area Command, the house of the 13th Dalai Lama at birth in Nangxian county and other red sites. Already in March this year, the China Tibet Information Center had announed two more railway extensions in Tibet: "Two more railways linking Lhasa with Xigaze (Shigatse) and Nyingchi (Nyintri) will start construction, said Zhang Qingli, Tibet regional Party committee." Zhang added: "As more and more tourists visit the Tibet Autonomous Region, it is difficult to buy tickets either for trains or for airplanes. With the improvement of traffic conditions, visitors will be able to have their journey in a larger scope and the pressure for traffic will be reduced. ...As for the environment pressure, for such a large-area Tibet, several million tourists with environmental protection consciousness can't destroy." Well, I will not comment on the environmental aspect, but on the strategic angle, it is a very serious development and unfortunately, the present Indian Railway Minister has other more important commitments. 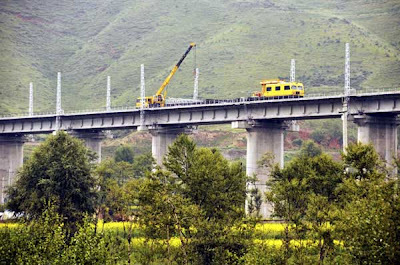 I am reproducing another news item: China will completed the 2nd Line of Xining-Tibet railway line to Lhasa in 2010. The same website shows pictures of the construction: "Rail workers use cranes and construction vehicles to build the Xining-Golmud Second Line of the Qing-Tibet Railway on the Bayante Bridge, Huangyuan country, Xining city, Northwest China's Qinghai province on July 21, 2010. 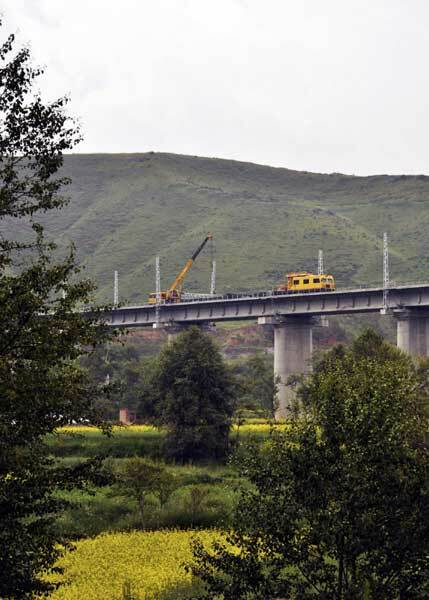 The line is expected to be completed by the end of 2010, ahead of the plan deadline by 21 months. It will be an electric railway with a cargo transportation capability of over 50 million tons a year and its passenger trains will attain speeds of up to 160 km/h." Please note that project will be completed 21 months ahead of time. India perhaps needs to hire China's Railway Minister! Que Sera Sera – Whatever will be, will be. Thus ends a fascinating book, Hinduism and its Military Ethos written by Air Marshal RK Nehra. According to the retired Indian Air Force officer, it could be the motto of India: The future is already written, we can’t do anything about it! At the level of an individual or a nation, the blind acceptance of the present, as it is and the future, as it will be can have critical consequences. Air Marshal Nehra relates one by one the battles that the Indian nation has gone through for the past 2300 years and shows that the loss of ‘warrior’ mindset by the country’s leadership has often resulted in slavery. According to him, the problem is that India is “stuck in the bhool-bhulayas (blind and dark alleys) of ahimsa, shanti and satya”. Of course, there is nothing wrong with these great Indian virtues which have been the ideals of every Indian for millennia, but the problem seems to be rather that instead of being the final goal, the ultimate objective of a civilization, they have become the means to achieve this end. Mixing up the goals and the means is the tragedy of India. Chanting shanti, shanti or speaking of ahimsa on a battle field (or on the parleys’ table) does not help to achieve shanti or remove the violent instincts in the opponent, especially when one faces a rogue one. Though Nehra restricts himself to military matters, the mindset described by him also exists in other fields, particularly in diplomacy. Take the example of the recent ‘Islamabad talks’. I was shocked to read the comment of an ‘eminent’ analyst who said that ‘India shone’ in Islamabad. Why? Because India did not respond to the insults received. One can understand that the Indian Prime Minister wants to leave some trace of his passage at Race Course Road and is ready to take some risk for that, but why silently accept insults. When Pakistan Foreign Minister Shah Mehmood Qureshi compared Home Secretary GK Pillai to Jamaat-ud-Dawa Chief Hafiz Sayeed and complained that his Indian counterpart S.M. Krishna took telephonic instructions from Delhi, the Indian side only feebly protested. 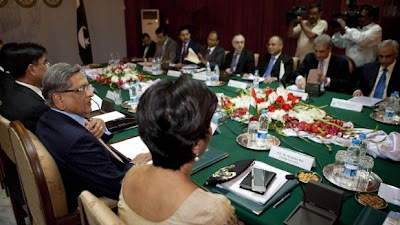 The next day, the Indian Foreign Secretary even said that the talks were on. Que Sera Sera! The worst is that Pillai was punished for standing by ‘satya’, he had just confirmed that the ISI had been involved ‘from beginning to end’ in the November 2008 Mumbai terror attacks: the Ministry of Home Affairs has now appointed a new spokesperson for the Ministry. Indian diplomatic blunders would take pages and pages just to list. One of the biggest, according to me, was the Panchsheel Agreement through which India unilaterally surrendered her rights in Tibet, without getting even a proper demarcation of her frontier in return. The Machiavellian Chinese Premier Zhou Enlai enigmatically declared that all the issues ‘ripe for settlement’ had been solved. Nobody reacted till several years later when it was too late (the Chinese had already built a road through Indian territory, in the Aksai Chin area of Ladakh). Here, I differ with his view. There are many examples of Buddhist ‘warriors’, defending the highest Indian values. Even in modern India, without the Nubra Guards of Colonel Chhewang Rinchen, who received twice the Mahavir Chakra, Ladakh would today be under Pakistani occupation. One could also cite the role of the Ladakh Scouts during the Kargil conflict or on the Siachen glacier and the Tibetan Special Frontier Forces who participated in the Liberation of Bangladesh in 1971 and several other battles. For Buddhism (as well as for Hinduism), a tradition of defending the highest Dharma has existed; Nehra himself quotes the Bhagavat gita: hatova prapsyasi swargam jitva bhoksyase mahim (Slain in battle, You attain Heaven, Gaining victory, You enjoy the earth). He speaks at length of India’s military campaigns and India’s lost chances to send back the invading forces to their Penates. 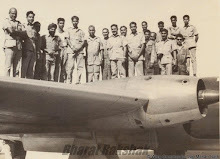 One of the first ‘blunders’ of Independent India occurred in January 1948; suddenly the Indian forces stopped their advances in Kashmir and the raiders were not pushed back to Pakistan. If one studies history, one discovers that Indian defeats have always been the result of wrong interpretation of the Indic spiritual tradition. Sixty years later, India is perhaps ‘shining’, but losing battles. At the end of the day, is it not a problem of leadership? India has unfortunately only had leaders who sing: The future's not ours to see! Que sera sera! My article China has its eyes set on Afghanistan has been published in today's New Indian Express. Click here to read. In India, we believe in "Satyamev Jayate" (the Truth will prevail). The problem is that usually it takes a bit of time, but we keep faith that truth will slowly, but surely emerge. This Report of Human Rights Watch brings some 'inconvenient' (for Beijing) truths on the '2008 incident' as the Chinese prosaically call it. Human Rights Watch accuses Chinese authorities of using disproportionate force and “acting with deliberate brutality” in the aftermath of antigovernment protests in Tibet two years ago, in a report likely to reignite debate over Chinese rule of the region. Human Rights Watch said its findings in the new report released today were based on interviews with some 200 people and official sources of information. The police crackdown started after March 10, 2008 protests against Chinese rule turned into violent riots in Lhasa and other parts of Tibet and neighboring provinces. Officials said some 21 people were killed. Tibetan activists put the toll much higher. After the protests, the government strictly limited outsiders’ access to Tibet, for example, only allowing a handful of foreign reporters in on tightly scripted government-run trips. Researchers on the report say they were unable to confirm either version’s death toll because of the restricted access. But they said their interviews revealed a widespread pattern of abuse and mistreatment of prisoners and called on Chinese authorities to reveal the total number of people detained, and release those still being held without charge. Authorities have repeatedly defended their actions, saying they were acting within the law to prevent looting from getting out of hand, and have denied accounts they used deadly force in responding to protests. In early July, at the end of a prestigious career in the French Army, General Vincent Desportes was summoned by his boss, Admiral Edouard Guillaud, the French Chief of Defence Staff. Why? General Desportes, who is presently Director of the Interservice Defence College in France, had dared to speak out what many civilians and defence officials believe. Desportes gave an interview to the daily newspaper Le Monde in which he stated that the conflict in Afghanistan was ‘an American War’. He also said that the sacking of General McChrystal, the Commandant of the NATO forces in Afghanistan should “open a debate on the tactic decided [by President Obama and the NATO]”. For Desportes, the situation on the battle field has never been worse. After explaining that Obama had chosen “a Middle Path which does not work”, he said that it was time to review the NATO strategy. The Chief of Defence Staff and his Minister, Hervé Morin were not amused. Though General Desportes is due to retire at the end of July, he will probably be punished for telling the truth. This incident is symptomatic of the feelings not just in France, but in most NATO nations (including in the United States as witnessed in l’Affaire McChrystal). The main French survey organization IFOP has recently found that 70% of the population is “opposed to the French military intervention in Afghanistan”. Let us not fool ourselves. In the past, great empires have rarely been built for philanthropic reasons. The British did not ‘civilize’ the Indian subcontinent for the good of the natives, ditto for the French in Africa. The ‘colonized’ countries happened to be rich in raw materials direly required to feed the economic engine of the paramount powers. The recent happenings in Afghanistan seem to follow the same pattern. Remember. A month after the tragedy of 9/11, the United States, supported by several other countries from the NATO alliance, began bombing the Talibans (more nebulously known as Al Qaeda). 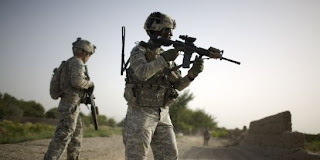 The military operations’ objective was to grab the power out of fundamentalist hands and prevent the use of Afghanistan’s territory as a terrorist base. At the same time, nobody in Washington thought that ‘terrorism’ could also have some roots in Afghanistan’s neighbouring country, Pakistan was THE ally par excellence. Eventually, the Taliban regime of Mollah Omar fell and the NATO forces started to ‘control’ the country. Till then, things were still simple to understand. Unfortunately nine years later, ‘control’ is still missing. Beijing knows that the Americans and their NATO partners will start withdrawing one day or another. Though China does not want to interfere in the ‘security aspect’, the leadership in Beijing is aware that there is a place to take in the future economy of the country. The security angle is however not completely negligible, as the leadership in Beijing would not like to see its Western provinces, particularly the restive Xinjiang Uighur Autonomous Region (XUAR), destabilized. 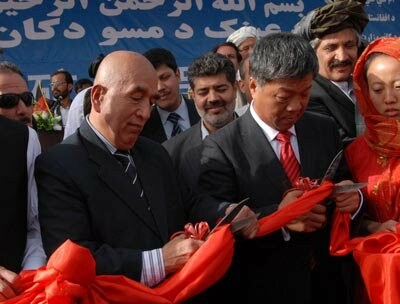 It was one good reason for President Hamid Karzai to visit China in March 2010. It was his fourth trip to China as President and according to analysts a sign that Kabul has wanted to diversify its patrons and not bank entirely on the US. At the same Time, Beijing is interested by the raw materials in Afghanistan. The report speaks of a 75 kilometers-long road, extending up to 10 kilometers from the China-Afghanistan border. The road, built by the Chinese Ministry of Defense is badly needed for the transportation of military supplies to Chinese frontier guards. Further, the Chinese have constructed a supply depot to improve the “food quality standard for the police forces”. The third development is a mobile communications center which would permit the operation of mobile devices along the border. Earlier border troops had to depend on satellite communications. Russell Hsiao agrees that China is not ready to play a ‘strategic’ or military role in Afghanistan. With the ‘discovery’ that Afghanistan is a rich country (not only for its poppies), cynicism is bound to increase. Many believe that we are witnessing the beginning of a new Great Game, as during the 19th century. Unfortunately, Delhi has a big problem. Were India to get a stake in the minerals, how to bring the raw materials back home? While China may use the Wakhan corridor in the years to come, India has no land route to exploit the mineral-rich Afghanistan. Technically, Indian companies like Arcelor-Mittal or Vedanta could have a chance, for example when the bid for Hajigak iron ore mines opens up, but Pakistan will certainly not allow raw materials to transit through its territory. The other road through Iran is also doubtful in view of the new UN sanctions against the Islamic Republic. Manmohan Singh would certainly not like to antagonize his American friends. For the near future, the Chinese are bound to win the raw materials market in Afghanistan. While the NATO forces are fighting an unwinnable war, Beijing has quietly started tapping the wealth of the country. India may be highly considered by the people of Afghanistan, but in the end China is better prepared and one point is sure, Beijing will put pressure on its all-weather friend, Pakistan not to allow India around. The recent international conference in Kabul did not alter these basic facts. According to some news agency reports, the International Energy Agency (IEA) has announced that China had surpassed the United States to become the world's top energy consumer. Though Beijing called it an 'unreliable' data, The Financial Times and the Wall Street Journal cited a top IEA official as saying the Asian giant had taken over the top spot in 2009, earlier than expected. According to the IEA, China consumed 2.252 billion tons of oil equivalent of energy in 2009, from sources that included coal, nuclear power, natural gas and hydroelectric power -- about four percent more than the United States. The Chinese ogre is bound to use more and more the resources 'at home' (read in Tibet). It is bad news for the Tibetans. Today, Xinhua published the following article. China National Gold Group (CNGG) said Monday the first phase of its Gyama polymetallic mine in Lhasa, capital of the Tibet Autonomous Region, began production Monday, giving a boost to economic development in the mineral-rich region. Located in Meldro Gungkar County, the first phase of the project has an expected daily output of 6,000 tonnes. CNNG subsidiary Tibet Huatailong Mining Development Co. started construction on the 8 billion yuan (1.18 billion U.S. dollars) project in 2008. The mine will eventually have a daily output of 15,000 tonnes, but the company did not say when that will be. The company will pay up to 700 million yuan per year in taxes once the whole project is operational, according to the company. Hao Peng, deputy secretary of the Chinese Communist Party regional committee in Tibet, said the project will promote economic development in Tibet and help meet China's soaring demand for non-ferrous metals. Sun Zhaoxue, CNGG general manager, said the company invested 250 million yuan in work safety and environmental protection for the project. CNGG, China's largest gold producer, has more than 1,300 tonnes of gold reserves, 8 million tonnes of copper reserves and 1.2 million tonnes of molybdenum reserves. This is another important aspect of the Karmapa issue. One tends to forget that the young Lama is still persona no grata in his own monastery. Why? Probably for the reasons given in my Sify.com article. I think that there is still a case pending in the Sikkim High Court. 'China is changing', say the experts.But Communist China remains the same. (8) leading cultural system reform, including the publication and broadcasting industries. She may not be able to contact her boyfriend. It is tough, isn't it? What will the lonely hearts of the People’s Liberation Army do now? Rigid restrictions on Internet usage imposed this month on the 2.3 million-strong Chinese armed services are sure to cramp the already lackluster social lives of the predominantly young, male force. Online dating was given the boot, along with blogs, personal websites and visits to Internet cafes. It may seem harsh and out of touch, particularly for troops posted in remote regions of China who have little contact with the civilian world. But military experts said restraints are necessary to avoid compromising security for a Chinese military that prizes secrecy. “Some soldiers leaked military secrets when chatting online, for instance, giving away troop locations. Certainly a large amount of secrets were revealed this way and the regulation has just blocked the hole,” said Ni Lexiong, a military expert at Shanghai University of Political Science and Law. China is just the latest country to wrestle with the sticky issue of Internet freedoms for its military, trying to find a balance between the demands of Web-savvy troops, who as civilians were used to sharing personal details online, and the need to maintain security. After years of back and forth, the U.S. Department of Defense now promotes use of social media by everyone from privates on the front line to generals at the Pentagon as a way of spreading its message. For example, Adm. Mike Mullen, chairman of the joint chiefs of staff, has 20,000 followers on Twitter. Most other countries fall somewhere in between. “Cyberspace has been a gray area. This is a tricky issue because it straddles both personal and professional space,” said Ho Shu Huang, an associate research fellow at the Institute of Defense and Strategic Studies at Singapore’s Nanyang Technological University. “The military is a reflection of society and how it responds will be a result of that. So in more closed societies, it’s easier for the military to say, ‘Don’t do anything. Don’t talk online. That’s that,’” he said. Countries such as Britain and Israel allow troops to post personal information online, as long as it does not compromise military operations. The open approach has not always worked for Israel. The Israeli military scrapped a raid on a West Bank village earlier this year after a soldier revealed the time and location of the operation on his Facebook page. In 2008, a soldier attached to an elite Israeli intelligence unit was sentenced to 19 days in jail after uploading a photograph taken on his base to Facebook. The Chinese Internet prohibitions are a brief part of lengthy internal affairs regulations issued by the Communist Party’s Central Military Affairs Commission. It was not clear if troops would be completely cut off from social networking sites. The regulations do not apply to civilians serving in military research and training academies. It’s also not known how authorities in China plan to enforce the restrictions. The regulations, posted on the Ministry of National Defense’s website, did not say how troops would be punished for transgressions. Phones rang unanswered at the ministry’s information office and questions submitted by fax were not answered. Yet the prohibitions seem out of step in a wired society with 400 million overwhelmingly young Internet users in a country hurtling toward prosperity and global power. “(The policy) is regressive in its understanding of technology, regressive in generational attitudes and regressive in transparency and attitudes we have of leading powers in the 21st century,” said Peter Singer, director of the 21st Century Defense Initiative at the Brookings Institution. Chinese social networking sites and instant messaging programs are wildly popular. Young Chinese office workers chat online with friends throughout the work day. Internet cafes in small towns are packed with youngsters playing games. Ni, the Chinese military affairs expert, said in the past soldiers had been allowed to visit Internet cafes in plainclothes and some had become addicted to the pastime. The stipulation that troops cannot “make friends through the public media” is likely to be unpopular. In recent decades, rank-and-file soldiers often drawn from poorer rural families and until recent years paid miserably have found it hard to find spouses. The Internet has been a boon, with a proliferation of unregulated online dating sites targeting military men. The Chinese military now plans to attack that problem the way it did decades ago, when it arranged socials between military units and civilian work outfits with heavily female work forces such as textile factories. A report on a military news website said the Xigaze Military District in central Tibet is working with the local government and women’s federation to help troops find partners. Ho, the researcher in Singapore, said the restrictions are meant to prevent people from getting an inside look at the military. He said security lapses don’t usually involve highly classified information, but rather small details that intelligence agents can use to piece together a larger picture about an operation or a unit. My views on the Government of India's refusal to let the Karmapa leave for America have been published in Sify.com. Click here to read. Yesterday a friend commented on my remarks about a successor for the Dalai Lama. He rightly said that the Tibetan movement will need a charismatic leader when the Dalai Lama goes (hopefully, he will be here for a long time). I agree with him, but there is still an ambiguity between a 'selected' successor and an 'elected' Kalon Tripa (Prime Minister). The solution is perhaps to have the Karmapa elected as next Kalon Tripa. Why not? Ogyen Trinley Dorje, the 17th Karmapa will not go to the US. At least for the time being. I will not comment on the possible reasons for the Government of India to refuse the clearance. I did this earlier. However, I would like to talk about what could be a secondary factor in the decision: the fact that the press projects the young Lama as the Dalai Lama's successor. I think that it is wrong. First, what does it means to be 'the Dalai Lama's successor'? Spiritual successor? Political successor? Regarding spiritual or religious affairs, only the next Dalai Lama can be the successor of the present one's. Further, there are several very wise Lamas in exile with great spiritual and religious experience and wisdom who could also pretend to become a 'successor'. Why to limit the choice to the Karmapa? In any case, does the Dalai Lama need a 'successor'. He recently hinted in an interview that he could live a very long life, perhaps till 100. It would therefore be wise to wait a bit. Regarding a 'political successor', the present Dalai Lama has worked hard from the early 1960's to introduce democracy in the exile community. To have a 'political successor' would mean to negate all these years of hard work. Would a 'political successor' prevail over an elected Kalon Tripa (Prime Minister). It does not make any sense. Tibetan democracy would become a laughable farce. Further, historically, the regency (with Regents or temporary successors) has been the bane of the Tibetan system of governance. Remember the power struggle between Regents Reting and Tagtra in the 1940's. It has taken the Land of Snows to the brink of a civil war. 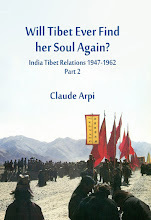 Of course, for certain media, a successor to the Dalai Lama sells well, but is it good for Tibet? Another question about of the denial of the permission for Karmapa's US visit: was it the message brought by Foreign Secretary Nirupama Rao to Dharamsala? Was the decision 'influenced' by Beijing (National Security Advisor Menon visited China a week earlier)? We will have to ask Paul the Octopus? 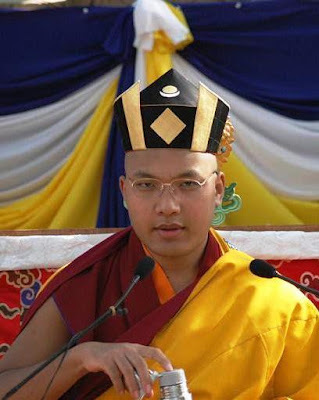 DHARAMSALA: India has denied permission to Ogyen Trinley Dorje, the 17th Karmapa who is the third most respected Tibetan monk reincarnate and is recognised by both the Dalai Lama and China, to go on a two-week religious tour to the US this month. His private office on Thursday said he was denied permission without citing any reason by authorities. "The Karmapa was scheduled to attend prayer sessions being organised by Karma Triyana Dharamchakra centre in Woodstock in New York that began yesterday (Wednesday), but Indian authorities refused to grant him permission to visit there," Gompa Tsering, Karmapa's secretary, said. "We fail to understand that why restrictions were imposed on his movement as the tour was purely a religious one. Moreover, the government has not cited any reason for declining to grant permission," he added. The Karmapa office in Gyoto Tantric Monastery got information from the Tibetan government-in-exile about Delhi's refusal to permit foreign visit. "He was scheduled to visit Europe for five weeks in May, but he was denied the permission at that time too. May be at that time, he was declined permission because the tour was too long. We hope the (Indian) government would be more positive and open towards his future religious programmes," said another Tibetan official. Born on June 26, 1985, in Kham region of eastern Tibet, Dorje fled Tibet and sought refuge in India in January 2000. Ever since, he has mostly lived in the monastery in Sidhbari near Dharamsala - the seat of the Tibetan government-in-exile. The Football World Cup is over. One question remains, will Paul the Octopus retire after his meteoric rise as the foremost diviner in the world? The English-born cephalopod mollusk presently resides in a Sea Life aquarium in Oberhausen, Germany. After correctly predicting the winner of the World Trophy, he apparently received some death threats; being highly intelligent, like all octopuses, he will probably lie low for some time. The proverb says that “none is prophet in his own country”. In Germany, Paul could prove this saying wrong. He could advise Chancellor Angela Merkel on which economic direction to take the country if she wants to win the next elections. Though Christian Wulff, a Merkel supporter was recently elected German president, what should have been a mere formality, given Ms. Merkel’s large majority in parliament, turned out to be an extremely painful process. Heinrich Oberreuter, a political analyst at Passau University commented: "It could be a wakeup call for her to design strategies to regain people’s trust. This is vital." But what strategies? It is where Paul’s skills could certainly be valuable. Without proper counseling Angela Merkel is bound to lose the next elections. Next door in Belgium, Paul’s services are needed also. Belgium recently assumed the rotating EU presidency for the next six-months, but the bi-lingual nation still has no government. Outgoing Prime Minister Yves Leterme will run the European Union as an acting Prime Minister. Though observers believe that this is perhaps better, since a properly elected and representative government would have had to listen to too many cooks and ultimately the sauce would have turned sour, Leterme keeps nevertheless trying to form a Cabinet. He would like a coalition government bringing together affluent Dutch-speaking northern region of Flanders and poorer francophone Wallonia in the south. Let all the parties agree that the name picked up by Paul will be the next Prime Minister. Better to have an octopus-selected PM than to run a nation with acting PMs for years. Let us stay for a moment in Europe. President Sarkozy of France is in a dilemma. Should he kick out his Labour Minister Eric Woerth who has presumably been involved in financial dealings with L'Oreal heiress Liliane Bettencourt. Rightly or wrongly, Woerth, chief fundraiser for Sarkozy's UMP party is accused of accepting 50,000 euros (‘peanuts’ Indian politicians will say) for an electoral campaign. During a recent TV interview, President Nicolas Sarkozy rejected all claims that cash had been pocketed, he said: “The political class, left and right alike, is in general, honest. French public officials are people of great rigour." Unfortunately, his rating in the surveys is going down by the day. To dump Woerth could certainly improve his chances for future elections, but it is a difficult decision to take. Monsieur Sarkozy, Paul can help you! Don’t miss your chance! While in France, Paul could greatly help the nation by selecting the next football national team. We all know the miserable performance of Domenech’s players during the just concluded FIFA World Cup and the lamentable French Revolution spearheaded by some of the French players against their mercurial coach. Since decades, France had never fared so badly in a world competition. Thanks to the Gaulish Gods, the new coach Laurent Blanc (of 1998 vintage) has now taken over from Domenech, the most hated person in the Land of Asterix. Who should be selected to take France to its true place in the FIFA ranking? It is difficult question which could easily be solved by Paul provided that the names of Nicolas Anelka, Patrick Evra and William Gallas are not in the aquarium. Noted economists have begun serious studied to determine if the Spanish victory in South Africa can save Madrid from an announced bankruptcy. Can the exploits of La Roja revive a moribund economy? Public deficits have reached record levels (some 11.2% of the GNP) with unemployment as high as 20%. According to a study sponsored by the ABN Amro in 2006 (known as Soccernomics) “the World Cup winner enjoys an average economic bonus of 0.7% additional growth, while the losing finalist suffers an average loss of 0.3% compared to the previous year.” The study however warned: “The effects at macro-economic level and on the financial markets are not so great that they can turn a recession into a boom.” José Luis Zapatero, the present Prime Minister is before a terrible dilemma to save his country’s economy. Should he further reform the public spending and risk greater recession or should he borrow more from the new European fund to give a new dynamism to the economy? The answer could come from Paul who is infallible. He would certainly do this for the winner of the World Cup which made him famous. We know that one of Barak Obama’s babies is to reform US finances and particularly the stock markets. For this he has the support of the European Union and more recently US lawmakers have agreed to a historic overhaul of financial regulations. It was a great domestic policy victory for Obama on the eve of the G20 summit devoted to financial reforms. As soon as the financial package was passed after a marathon debate in the US Congress, Reuters commented: “Lawmakers munched chocolates to stay awake”, but added: “Financial regulation could dramatically reshape the US banking industry, but it is not the end of life on Wall Street as we know it.” Paul could be of great help to traders speculating on ‘winning’ shares. One can even envisage that clever traders will start a new venture of ‘octopus cloning’ to get more dividends. Let us hope that it will not end with thousands of small Paul look-alikes. The magic would be lost. Tibetans have traditionally been the masters of the Art of Mo (or divination). The science was developed more than 2000 years ago; long before Guru Padmasambhava, the Indian master introduced Tantrayana on the Roof of the World. In Tibet, each and every Lama is a bit of a diviner and possesses skills and techniques to explore the future. The most famous, like the Nechung Oracle, have been able to judiciously guide the Lhasa Government and the Dalai Lamas for centuries. But today the Tibetans have a problem: a jealous Communist leadership also wants to practice divination. They have found a trick by putting a few names in a ‘golden urn’ and rotating it, they say they are able to find the name of the new body of a reincarnated master. As a result, we have today two Panchen Lamas, one found traditionally by the Dalai Lama (he has been imprisoned for the past 15 years) and one discovered by the Communist diviners. Why not ask Paul, he will certainly tell us that an atheist government who believes that religion is poison is wrong in its choice. Will the Politburo dare asking Paul? In the fall of 2012, China will witness a major leadership change during its 18th National Congress of the Chinese Communist Party. The present top leaders including President Hu Jintao, Premier Wen Jiabao and Chairman of the National People’s Congress Wu Bangguo are to retire. The Standing Committee of the Politburo will have 7 new faces (the present strength is 9). The process is said the most opaque in the world (it is clearer in North Korea where the Son always succeeds a Dear Leader). One way to bring some transparency (‘glasnost’ in Russian) would be to invite Paul to the Great Hall of People in Zhongnanhai, the exclusive enclave where the Communist Nomenklatura live and ask our dear octopus to select 7 new members for the Standing Committee and some 20 names for the Politburo. It would go a long way in restoring the confidence of the people in the Party. 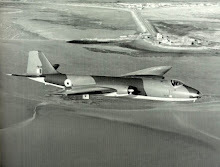 Paul could of course have tremendous success in India; for example in deciding the Foreign Policy of the country or the perception threat for the Defence Forces, or even selecting 126 Medium Multi-Role Combat Aircrafts for the Air Force. But it is still for cricket that Paul’s talents could be outsourced in the most efficient way. 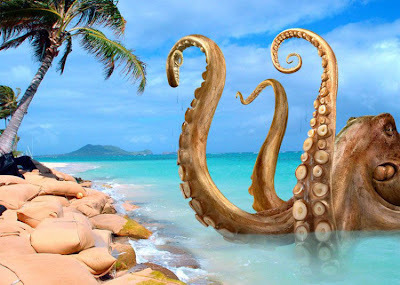 Instead of having Cabinet Ministers, Ministers of States and their relatives or girl friends ‘sweat’ to form a good IPL team, let the Board give the job to Paul who will do it free of cost and will be absolutely impartial (octopus do not eat bank notes). The quality of the game could really improve and we could even see some Pakistani participation (good for MEA’s ‘soft’ diplomacy). Finally, I have to mention a topic which weighs upon each and every mother and father in India: match making. Of course, here the demand will be so great that cloned octopuses may have to be used. But once everybody is convinced that these mollusks can’t fail in finding the right match, it will be a tremendous success. One problem only, how will the khap panchayats react? But nothing can stop globalization; the outsourcing to octopuses is an ineluctable phenomenon. The end of a world? In the fall of 2012, China will witness a major leadership change during the 18th National Congress of the Chinese Communist Party. The present top leaders including President Hu Jintao, Premier Wen Jiabao and Chairman of the National People’s Congress Wu Bangguo are to retire. The Standing Committee of the Politburo will have 7 new faces (the present strength is 9). The process is said the most opaque in the world (it is clearer in North Korea where the Son always succeeds a Dear Leader). 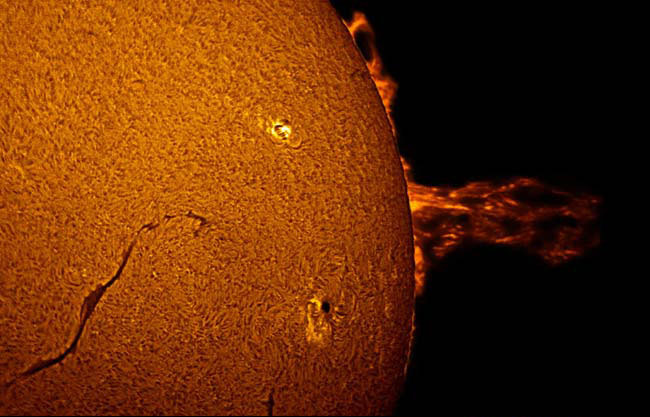 Will these tremendous solar explosion help to bring some ‘glasnost’ (transparency) in the proceedings in the Great Hall of People? End of 2012 is also said to be the end of a cycle in the Maya Calendar.Tremendous changes were expected by the Mesoamericans around that time. We have one and a half year to wait the results of all this. Does China support Kashmir insurection?